That's me on the bench. The other good goat picture has me in my C-3P0 under roos. You don't need to see that one. Hi, I’m Margaret Telsch-Williams. Since you've clicked here, I should tell you a little about me. For starters, as a kid I lived on a goat farm in rural Virginia. I spent a decade digging in the dirt, searching for newts in a creek, milking goats, collecting eggs, running around in the forest, and pretty much living a child’s dream save for the family outhouse which was not, in fact, part of the dream. I’ve pumped water by hand. I’ve cut a lot of wood. A lot. Of wood. And I’ve spent my fair share of time around animals. Later I went to college at Virginia Tech. Shocker: I majored in biology. Nature and science had gone hand in hand with discovery and wonder as a child. Why not as an adult? So I studied invertebrate zoology, ecology, biological statistics, mammalogy, animal behavior (my favorite of all), organic chemistry, and genetics. "Dolly the Sheep," clone of all clones, had happened just a few years prior. Everything was interesting and amazing. But the thing about college is they want you to be “well rounded.” You have to learn about life, not just your major. Electives are thrust upon the masses and you gotta take some. Time and time again, I took English classes. I studied poetry, sci-fi/fantasy, literary fiction, and journalism. I fell in love with Toni Morrison as well as William Faulkner. I wrote and read, and read and wrote. I took so many English department classes that I finally asked what I needed to do to minor in the subject. Believe it or not, I only needed two more classes. Done. After I graduated I worked with animals at the VA-MD veterinary school at Tech. I studied their behavior and I studied their brains. I felt at home in academia where there was and is always something new to learn. But the four-walled laboratory life was not satisfying. During breaks, I wrote and revised poems and short stories. I even audited a few English classes since I was already coming to Tech’s campus everyday for work anyway. Then, life took hold. I met and married my darling “Hubs,” Brian, and we had “Kiddo,” our daughter, Zoe. I left my job at the vet school when we married and took one close to home until Kiddo was born. Three weeks later, I heard back from my MFA application at Hollins University—I was on the wait list. If one person didn't accept attendance in the competitive 16 seat program, then I was in! Everyone accepted. I was devastated. Soon after, like a few days after, I got a notice that I could still attend Hollins if I pursued the Liberal Studies degree which is basically a compilation of electives. I was ecstatic with my consolation prize. If anyone could turn an elective-driven graduate degree into a closet MFA program, it was me—the Elective Queen. For two years I studied writing and changed diapers, read fiction and taught a small human to walk and talk. 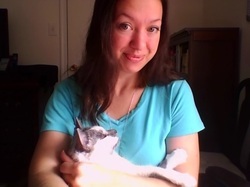 I wrote and revised a novel, and spent hours with my little girl sleeping in my lap while I plugged away at the computer. It was, for a lack of a better phrase, the best of times and the worst of times. I loved it. I don’t recommend it. Truth be told, writing and raising a child aren't the best bedfellows. But I've adapted and grown, and as Kiddo has gotten older, I've watched my writing time expand. The thing is though, even after I graduated, I never stopped exploring my world, and I never stopped writing. I think understanding more about our world helps us better understand ourselves and have compassion for those around us. I always want to maintain my child-like goat-girl wonderment for the world, while also fully grasping as much reality about this place as possible. Darwin discovered what he did because his experienced mind noticed the differences in new things. We should enter each day like this—intelligently looking with fresh eyes. But the writer side of me—the part that makes everything up and hears characters’ voices—also wants to go through life armed with information so I can twist it, alter it. In science, we study what we don’t understand to make things clear. In writing, we make things up so we can clarify what we already understood. My goal is to share with you both life’s facts and its wonderments. I want to offer information and entertainment, some of which will be true (the blog) and some that will be fiction (books and stories). Expect a twist on reality without ever straying too far from the farm.